Developed by Silicon Knights (Eternal Darkness and Metal Gear Solid: The Twin Snakes), Too Human is the latest brain child of this prestigious development company. Combining Norse mythology with cybernetics, Too Human is an adventure RPG title for the XBox 360 that has the gamer playing as the Cybernetic God Baldur from his humble beginnings. The birth of an icon. Fight as the powerful cybernetic god Baldur battling his way through enemy armies to become one of gaming’s renowned iconic heroes. From weaponry and armor to combat techniques and combos, you can fully customize Baldur to become the best possible hero. Explosive melee and firearms combat. It will take more than brawn and raw strength to supplant the machine hordes. Utilize a sophisticated blend of seamless melee and firearms combat to vanquish foes near and far. Witness the fluid grace of heroes and enemies in battle as enacted by the acclaimed motion-capture group F.A.S.T. Feel each punishing blow through advanced visual effects made possible through the unmatched horsepower of Xbox 360 and the Unreal Engine 3. Advanced cinematic presentation. Characters and environments come to life with unparalleled visual fidelity. Experience the full excitement of combat through a dynamically driven presentation system that portrays the combat with cinematic quality. Survive pulse-pounding battles against hundreds of on-screen enemies set against the vast landscape of the “Too Human” world. A sweeping orchestral score sets the mood for heartbreak, anger and bloodlust as each tune encapsulates the gamer within the immersive gaming environment. New level of accessibility through intuitive combat. Perform Baldur’s elaborate and complex combat maneuvers through the press of a button and chain together hundreds of rapid-fire attacks and combos with ease. 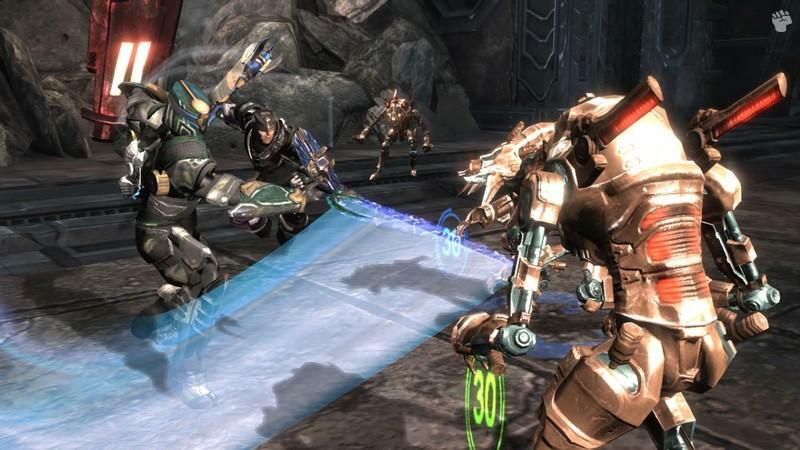 Through the use of an intuitive combat system, “Too Human” delivers gameplay that is easy to learn and rewarding to master. “Too Human” will introduce combinations of weapons combat on a level that exceeds some fighting games, leaving players in awe. Shared experience. Conquer the world of “Too Human” alone or with friends through advanced, four-player online co-op gameplay through the Xbox Live service. Modern take on a classic story. “Too Human” chronicles the ongoing struggle between cybernetic gods, giant machines and mortal men on a massive scale never before seen. Play the role of a cybernetic god charged with protecting the human race against a relentless onslaught of machines. Before starting, players must select their character class which is reminiscent of traditional RPG titles, although with a futuristic archetype. With that said, there are five different character classes to select from which include healers (Bioengineer) to fighters (Berserkers). As with all good RPG titles, each class is quite customizable and you really can give your character an almost unique individuality. For this review, we selected the "Champion" which is an all-rounder and is probably the easiest to master out of all the characters. This game is the first in a three part trilogy that has the player attempting to protect mankind from a nefarious ancient machine hell bent on the eradication of mankind. The story is nicely progressed through flashbacks that assist in drawing you into the character as you play this futuristic RPG of gods and technology. Although the title uses a third person view, the gamer does have the ability to choose from a few different "third person" views to assist with the gameplay as you interact with the gaming environment and challenge an almost unending hoard of foes. Even though your character can use a variety of futuristic guns, he also has access to melee type weapons such as swords and axes that is controlled through the dual sticks, with the guns controlled by the shoulder buttons. The control system is quite intuitive to use, however my biggest complaint is the lack of control over the camera that is generally controlled by the game and also which direction your character is looking. There is a button to reset the camera in which direction your character is facing, however it would have been nice to have more control over the camera view but unfortunately this was not possible due to the dual sticks used for gameplay. At best, it's quite fiddle some, however for those persistent, the title does offer some interesting takes on your more traditional RPG titles. Be defeating enemies, your player is awarded experience that can then be used to upgrade your character via the skills tree which has multiple branches, depending on which route you choose for your god. 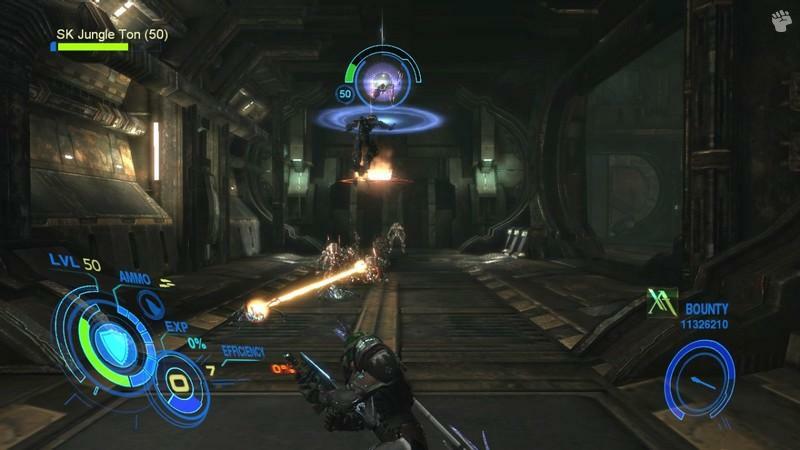 The game contains a variety of weapons, equipment and armour that is littered through the gaming environment, especially after you have defeated a plethora of enemies. You can discover runes which are used to power-up your weapons and amour with almost limitless opportunities. Although the game has an auto-save feature, if you do happen to die, a Valkyrie will just "resurrect" your character but some of your items will be impaired. 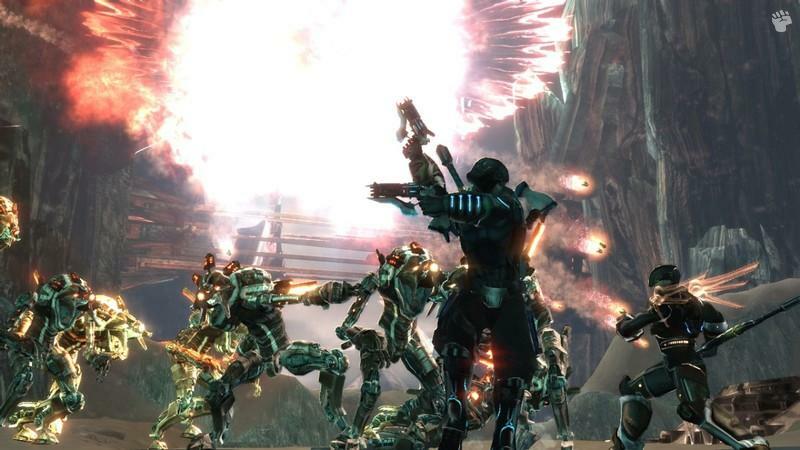 Although there are a variety of puzzles and challenges to solve, the combat of Too Human does become a little too repetitive, especially from the endless hoard of enemies that you face with the only noticeable differences are the boss battles. This becomes a breath of the fresh air from your normal combat attacks as you really need to think when the bosses appear in order to work out the right strategy to defeat them. The title features an online cooperative mode that allows you to fight with a friend and creates some great cooperatively battling, provided you have chosen two different classes. The unfortunate aspect of this mode is that the storyline is sidetracked but it actually is more entertaining with a buddy... so it's a mixed bag as to why Silicon Knights have created this strange hybrid game. Graphically, the title is a visual treat on the XBox 360 with some quite impressive gaming environments that portray an otherworldly and futuristic feel with a touch of classic Norse mythos. The attention to detail is great and match that with a variety of special effects and lighting and you have one good looking game. There is some tearing, however considering the amount of graphics that is being moved, it's quite forgivable. The game uses in-game graphics for cutscenes that work well with both the storyline and gameplay with the characters looking quite realistic. The musical score suits the genre perfectly, however where the title does shine is through its professional voice acting and realistic sound effects that sound great through our surround sound system. The only drawback of the title is the sometimes annoying squad banter that really doesn't add anything to the storyline, they just talk for the sake of it. Match that with some great background sound effects and its quite easily to be immersed into the world of Too Human. 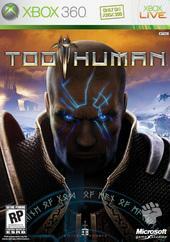 In conclusion, Too Human is a good futuristic RPG title that is unfortunately "just" missing the mark. If you can get pass the awkward control system of no camera control, the title does get better and the storyline is actually quite interesting without it being overly complicated. The customization of each character is quite in-depth and it offers those in a D&D rut to try something different. Definitely one for those looking for something a little different.